So you can customize your query by removing above three string in the IN clause. Cause: We cannot user order by clause using let since it needs singleton value. So we must have to user for clause to use order by clause. XQuery [query()]: The name "P" does not denote a namespace. Cause: It is incorrect to use namespace in Xquery in this way. Cause: Sql server doesn't support a sequence with different types. In the above sequence 1 and 2 are of integer type while a and b are unknown type. All values in a sequence must be of same time. XQuery: The name supplied to sql:variable('') is not a valid SQL variable name. Variable names must start with the '@' symbol followed by at least one character. 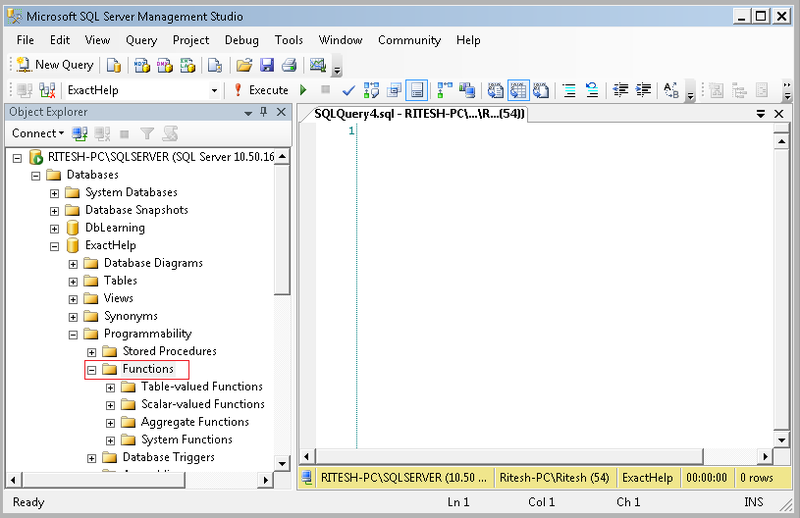 XQuery: The name supplied to sql:variable('$vcDbName') is not a valid SQL variable name. Variable names must start with the '@' symbol followed by at least one character. Cause: The local variable which you are using in the XQuery is invalid. In this example there is any local variable $vcDbName is not valid variable name. XQuery: Unable to resolve sql:variable('@vcDbName'). The variable must be declared as a scalar TSQL variable. 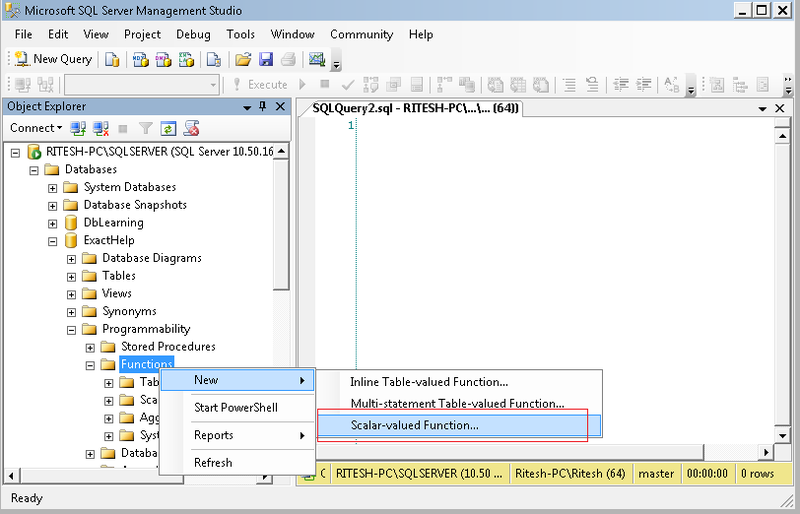 XQuery: '' referenced by sql:variable() is not a valid system function name. XQuery: '@@SERVERNAME()' referenced by sql:variable() is not a valid system function name. 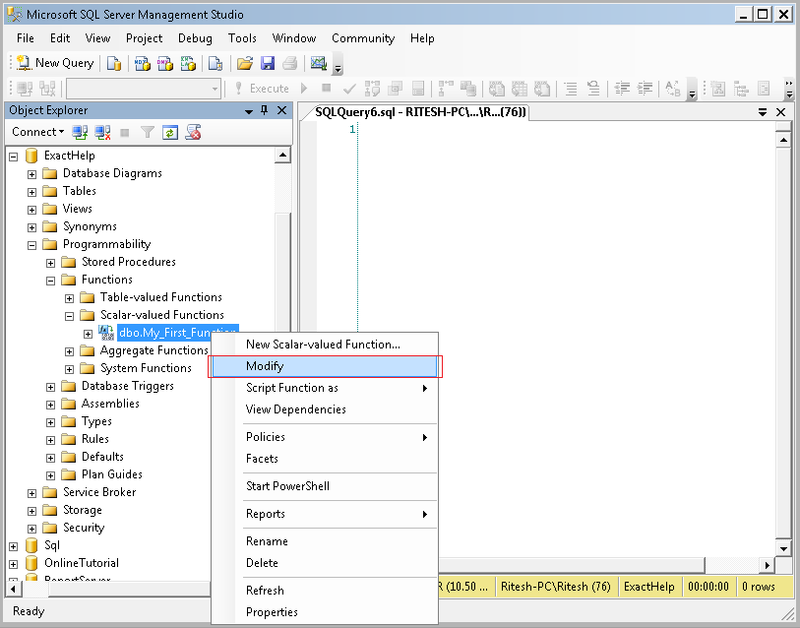 Step 5: To create My_First_Function function press F5 button of your keyboard or click on Execute button in SSMS. Step 6: After creating it will be stored under Programmability ->Functions ->Scalar-Valued-Functions node. To re-open or edit it expand programmability node and right click on your function name and choose modify option. Step 7: You can modify you script and to save it, press F5 button.